Today, the topic for Top Ten Tuesdays isTop 10 books I read this year. I read a lot of books which received 4 stars (out of five), so it was difficult to choose. Many of them are part of a series, so I’m including the parts I read this year. Honorable mentions to Karen A. Wyle: Who: a novel of the near future and Jordanna Max Brodsky: The Immortals. 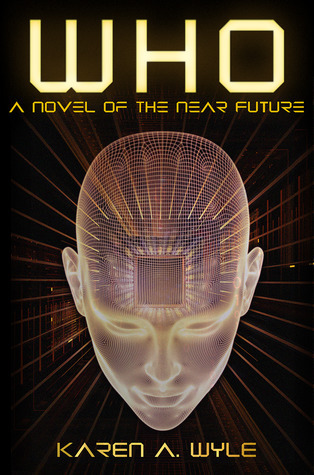 A stand-alone thoughtful science fiction book about what could happen if, when, people’s personalities are digitized. LiveAfter is a firm that specializes in digitalizing people’s minds. It’s a new concept and technology. So they’re giving incentives for people to sign up and advertising planned benefits even before their programmers make them. Of course, the leaders and investors of the corporation want to make a hefty profit. They’re promising that the digitized people can still interact with their families and friends, and that’s the biggest draw: that death doesn’t separate people anymore. Thea and Max are a young couple deeply in love. They’re musicians and because they made music for LiveAfter, they got a discount on their digitalization deal. Of course, because they’re young, they don’t think they’ll need it but Thea makes the deal anyway. When she dies is in a fatal accident, it’s up to Max to decide if she’ll be digitized. Max allows it. At first Thea seems to be almost the same person as before. She can even play the flute and compose. Legislation is changed so that the stored people can vote. Thea hasn’t been politically active before but now she becomes interested in politics. Did she really choosing to change or was is imposed by the firm? What makes a human… a human? If your memories are altered, are you still the same person? What if your opinions and worldview can be changed against your will? These are all questions explored in this book. Max and Thea are very sympathetic characters. They both struggle with loss and grief in a very human way. But they’re also intelligent and curious people. Thea’s parents also struggle with their loss. We also see the people on the other side of the conflict: the people running LiveAfter and their affiliates. However, they are left purposefully vague: most of them don’t even have names. The focus is on Thea, Max, and their friends. This is a very thought provoking read, as is usual for Ms. Wyle. Highly recommended. 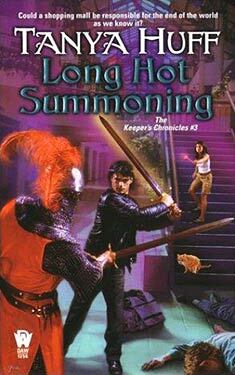 The third book in the Keeper chronicles. This time with two talking cats. Diana Hanson is a Keeper, person with witch-like powers who guards the world from forces of evil. Today is her last day in high school and she notices a source of evil, an ugly bracelet. Soon enough, she’s Summoned to her first work: Erlking’s Emporium a gift shop in a Kingston mall. It seems that someone is changing the whole mall into an Otherside spot and so trying to take over the world. Otherside is a place where people’s conscious and subconscious desires and fears take physical form. Diana realizes that she needs help from her older sister Claire. Together the sisters, and Diana’s talking cat Sam, head into the Otherside to fight evil right at the source. This means that Claire’s hunky boyfriend and her talking cat Austin stay at the guest house to entertain all comers, including a professor of archeology and his walking mummy. This was a fun and funny book but not as good as the previous one. Most the elements I enjoyed in the previous books are here such as Austin’s snarkiness, the pop culture references, and jokes. Austin and Dean are fun together, too. However, I didn’t really get the Australian jokes and at time the story is fractured to too many different places. Unfortunately, the book has lots of new characters whom we don’t really get to know and so it’s hard for me to really care about the budding romance. If you enjoyed the previous books, I think you’ll enjoy this one too. Unless you don’t like arrogant teenaged Diana, of course.